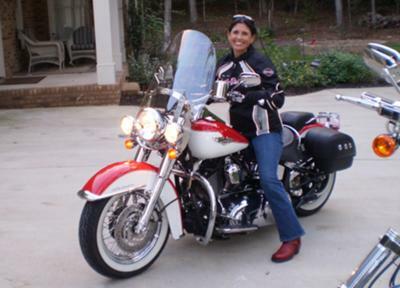 Terri and her 2007 Harley Davidson Softail Deluxe "Roxanne"
I have been riding for about ten years. This is my first Harley. I've never enjoyed riding so much till I got this bike. I bought her used, but I feel like she was designed just for me. I look forward to many miles with her!! Comments for Terri and her 2007 Harley Davidson Softail Deluxe "Roxanne"
I bought mine in September before I knew how to ride. I learned to ride on my bike and I love it!!! I can't imagine riding anything else. Nice bike Terri. I just bought used softail deluxe too, my first harley, and like you I feel it was made just for me. What was the most challenging parts of riding the Deluxe as your first bike? How did you overcome these challenges? YOU CAN RIDE IN MY NEIGHBORHOOD ANYTIME! Terri you look great on your bike. I want the shield and saddlebags for my bike when I get one. The HD is a classic look.